We are pleased to announce the beta release of LastPass for BlackBerry! 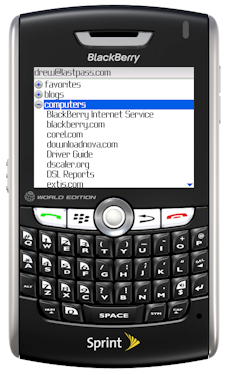 LastPass for BlackBerry is an application that allows you to access and edit your LastPass data from a BlackBerry smartphone. It can also cache your data in an encrypted file that gets stored on your BlackBerry, so it's available when you have no network coverage as well. To install, simply point your BlackBerry browser to https://lastpass.com/, and then select the large green "Get LastPass" icon. You can also browse directly to https://lastpass.com/LastPassBB.jad. LastPass for BlackBerry is still in an early beta stage, and as such, we'd love to hear comments from our users on how we might be able to improve and extend it. This application is the first in a new line of features we're calling LastPass Premium. You will be able to try LastPass for BlackBerry for free for 14 days, but you must become a LastPass Premium subscriber to continue using it after that. Along with LastPass for BlackBerry, LastPass Premium also gives you an ad-free experience and priority phone and email support. It's available for only $1 per month! You can read more and subscribe to LastPass Premium at https://lastpass.com/premium.php. We plan on augmenting our LastPass Premium feature set even more in the near future, with features including YubiKey support, an iPhone application, and Windows Application support. Stay posted for further details on these features.